Wow. Been far too long since I've posted here. It's been a turbulent year for me so far. Been a turbulent last 3 years really. I've been heavy involved with my family and taking care of my Moms and Pops. They've been trading back and forth amongst each other with life threatening illnesses. Most of my year thus far has been caring for my Mother in and out of the Intensive Care Unit. So, in relation, this tune has a lot of meaning and special feeling for me. Miraculously my Mom was finally released a week ago, and I'm overjoyed. Yes, things have been better and, Yes, I've gone back to the Gospel music fountain once again. Something a bit of a theme for me, admitting that Gospel music is the one music that pierces through to my heart when times have been hard. It has been a style of music that has been a never ending source of both enlightenment and entertainment. 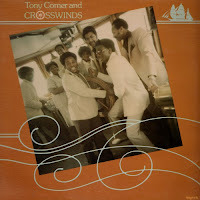 This is one of two Tony Comer Lp's that I'm familiar with. They are both really excellent albums and worth seeking out. They are both heavy 'commercial' attempts for bridging Gospel with Soul and attempting a stab at a mainstream ear. Hard for me not to notice the parallels with this LP and Earth Wind and Fire sound, as they both seem to be championing big, full, feel-good soul. Huge arrangements and large and lovely majestic messages. This is truly something unique of the late 70's early 80's soul. I think we'll have to follow up with more from Tony Comer and the Crosswinds camp, again mostly because the other LP is also so excellent. And, additionally a juicy 12 inch called 'Don't Give Up" both boasts an uplifting message and a hard head-nod beat in a modern soul feel. Nice to have you posting again, Mr. Boogie! thanks man! good to be back! !